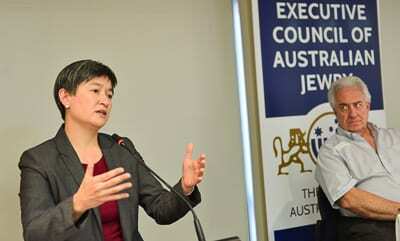 Senator Penny Wong tackled Labor’s perceived relationship with Israel at The Executive Council of Australian Jewry’s annual conference in Sydney. She began her address by saying that “it is good to recall Labor’s history of its relationship with the State if Israel” mentioning that Australia supported the UN resolution of November 1947 “proposing the establishment of Jewish and Arab states”. Senator Wong said that on January 1949 Labor Australian Prime Minister Ben Chifley announced that Australia would recognise the fledgling State of Israel and as president of the U.N. General Assembly in May 1949, Doc Evatt presided over the vote admitting Israel whilst on the same day Australia opened an embassy in Tel Aviv. Penny Wong declared that Labor’s support of Israel has been “long-standing and enduring”. She said that Prime Minister Ben Chifley’s support for Israel at its establishment has been maintained by every Labor Prime Minister since, mentioning Gough Whitlam, Bob Hawke, Paul Keating, Kevin Rudd and Julia Gillard. She added that Labor has always recognised Israel’s right to exist within internationally recognised secure borders and also “the legitimate aspiration of the Palestinian people to live in peace and security within their own state”. Senator Wong referred to the debate on the Middle East at Labor’s 2015 National Conference. She said the conference’s resolution also affirmed the federal party’s rejection of BDS. The senator spoke of her recent visit to Israel and turned her focus to the current situation saying: “The most recent spasm of violence across Israel and the Palestinian territories is a new and horrendous manifestation of this conflict.” She said that Labor condemns the stabbing attacks. She thanked the Jewish community for its assistance in the campaign for changes to Racial Discrimination Act. Senator Penny Wong is the Leader of the Opposition in the Senate. When can we expect Senator Wong and her mellifluous voice give the Palestinian Authority and Hamas the benefit of her advice about getting out of the way of making peace with Israel?